Some species of birds that lived in Florida during the Pleistocene no longer occur in state or even the region. A few of the more notable species include the California condor, magpie, and trumpeter swan. The extinction of the Pleistocene megafauna caused the extirpation of condors and magpies because they depended upon scavenging these animals as their most important food source. Other species of birds periodically disappeared from the state due to sea level rise when their nesting habitat became inundated. During some climate phases most of Florida became submerged, and a number of bird species simply never recolonized the state. I was reading through an article on the University of Florida Museum website the other day and learned of 2 additional species that lived in Florida during the Pleistocene but no longer occur in state–the Manx shearwater (Puffinus puffinus) and the northern jacana (Jacana spinosa). The Manx shearwater is an oceanic bird that nests in burrows on islands. 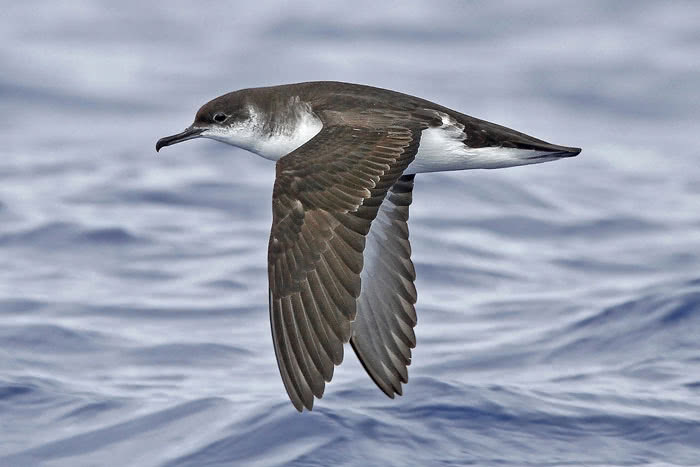 The Manx shearwater is an oceanic bird that nests in burrows on rocky islands off the coasts of Canada and Europe. They migrate to the South Atlantic during winter, flying over open ocean where they prey on small fish schooling near the surface. They rest by floating on top of the water. Scientists don’t know how they navigate to the same island colonies year after year. During Ice Ages when sea level fell and the land area around Florida expanded there must have been some offshore islands that emerged and provided nesting sites for colonies of Manx shearwaters. Islands emerged above sea level off the coasts of Georgia and South Carolina as well, and Ice Age oceans probably hosted higher populations of Manx shearwaters than exist today. I couldn’t determine from the available information where fossil remains of this species were found in Florida. It’s not listed in the Florida Museum of Natural History database and neither is the northern jacana, though I did find a paper that notes the presence of this species at 2 fossil sites. Northern jacana range map. Inundation by rising sea levels probably caused the extirpation of this species from Florida. 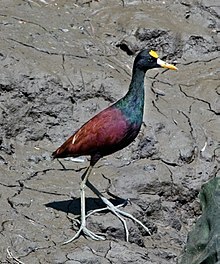 The northern jacana inhabits marshes. This species of bird often walks on floating mats of vegetation while it hunts the small fish and insects it preys upon. Because it appears to walk on water, it is sometimes referred to as the Jesus bird. Fossils of this species have been found at 2 sites in Florida–Lecanto 2A and Leisey Shell Pit. It likely became extirpated from Florida when rising sea levels eliminated its favored habitat.